The government's shock decision for the SEA 1180 Offshore Patrol Vessels project has left many unanswered questions, with answers not expected for several months. The selected designer Lürssen, which had teamed with ASC and Civmec, will now build 10 of the 12 vessels with Western Australia's Austal, as well as Civmec, while ASC will build the first two vessels in Adelaide. The decision will now see Lürssen enter into negotiations with Austal, along with Civmec, to determine each player's roles in the project. While there is some concern among Western Australia's SME community, the addition of Austal to the project may see its already established supply chain used in favour of Lürssen's, Austal CEO David Singleton told Defence Connect the rapid build up to construction will likely see the supply chain Lürssen put forward in its bid. "I think initially, because of the fast ramp-up to build, it is likely that the existing supply chain for this vessel will be used, and then every opportunity will be taken thereafter to increase the amount of Australian industry content," Singleton said on the day of the OPV announcement. Earlier this year, Lürssen Australia and its SEA 1180 OPV teaming partners also announced a scholarship and vocational education program - the Shipbuilding Education and Apprenticeship (SEA) program - in support of the Australian government's plans for a continuous naval shipbuilding industry. 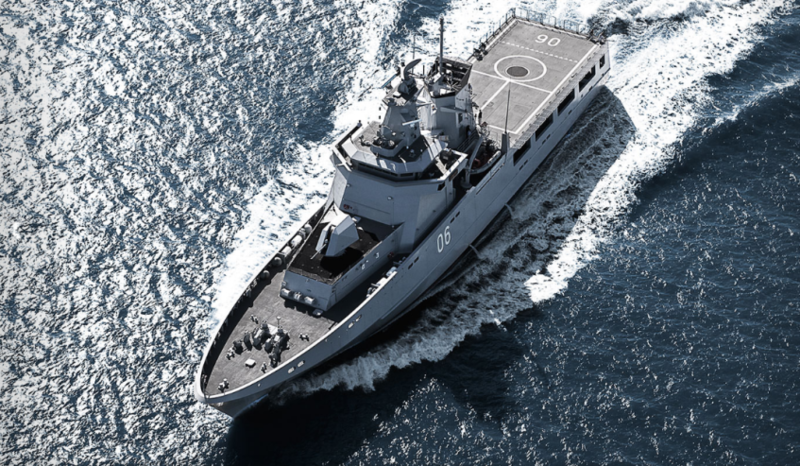 Under the program Lürssen and its OPV teaming partners, ASC Shipbuilding and Civmec, have partnered with South Australian peak industry body Defence Teaming Centre, which will manage the program and liaise with education providers. The scholarship program will include work placements in Australia and Europe for selected scholarship recipients with Lürssen, ASC Shipbuilding and Forgacs to develop professional experience. Whether this program will now include Austal remains unclear at this stage, but Singleton reaffirmed the company remains committed to various education programs. "We are very much involved in education and these kind of programs," he said. "We brought in 100 apprentices this year alone. Twenty graduates were involved with Edith Cowan University in education programs. We're involved in defence training colleges, all those sorts of things, and we always have been. We have been for years, not as a result of this program, but we have been for years." Under the SEA program, Lürssen and its industry partners will offer 12 scholarships valued at $10,000 each, per year, covering tuition and study related costs for relevant shipbuilding courses. Internships at Lürssen, ASC Shipbuilding and Civmec/Forgacs would also be offered to the three most promising scholarship students, giving valuable hands-on experience at nation- and world-leading facilities, including the latest warship design and manufacturing expertise. In its first year of operation, the SEA program will be made available to students from universities and vocational education institutions within the recently developed Defence Industry Education and Skills Consortium (DIESC), as well as the University of Western Australia and Charles Darwin University. DIESC institutions include the University of South Australia, the University of Adelaide, Flinders University, RMIT University, Edith Cowan University, South Metropolitan TAFE and TAFE SA. Peter Lürssen said Lürssen is committed to establishing an export hub within Australia, as well as meeting and exceeding Australia’s skilling, warship design and construction requirements, as set out in the Naval Shipbuilding Plan, released in May this year. “Much like our approach in Europe, which incorporates successful exports, we will set up an export hub within Australia to service this region, which is seeing rapid strategic and military developments," said Lürssen. "It makes perfect sense for us to be investing in local skills and talent. We expect the SEA program to be one way of developing future leaders of Australia’s world-class local industry." Lürssen beat out bids from Dutch company Damen, which was also partnered with ASC and Civmec, as well as German company Fassmer, which was in a joint venture with Austal for the SEA 1180 project. Construction will begin in Adelaide at ASC's Osborne shipyard next year.